Chemist and manufacturer of Dresden, Germany; born Aug. 17, 1871, in Uffenheim, Bavaria. He studied pharmacy and chemistry at the universities of Würzburg and Erlangen; and while he was still a student the Württemberg government, at the suggestion of the Würzburg professor of botany, Geheimrat Sachs, placed him on a commission for fighting a destructive vine-bug, the efforts of which body he directed to a successful conclusion. He was later appointed military apothecary of the Bavarian Home for Pensioned Soldiers ("Invalidenhaus"), and while holding that position he published several short pharmaceutical treatises which attracted the attention of specialists. His larger publications are "Beitrag zur Direkten Beeinflussung der Pflanzen Durch die Kupfervitriolkalkbrühe," Stuttgart, 1896, and "Repertorium der Photochemie," Vienna, Leipsic, and Budapest, 1901; and he contributed to "Hager's Pharmaceutisch-Technisches Manuale. 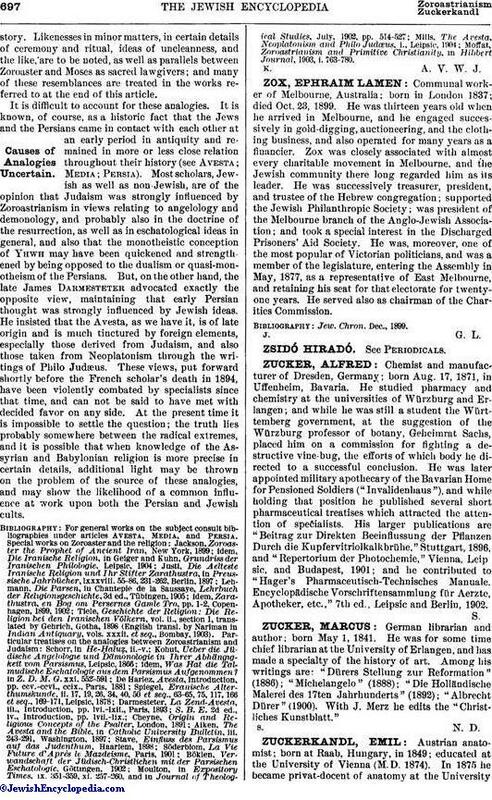 Encyclopädische Vorschriftensammlung für Aerzte, Apotheker, etc.," 7th ed., Leipsic and Berlin, 1902.